Download or visit statistics and review the full statistical reports. The November 2018 report will be released on December 19. 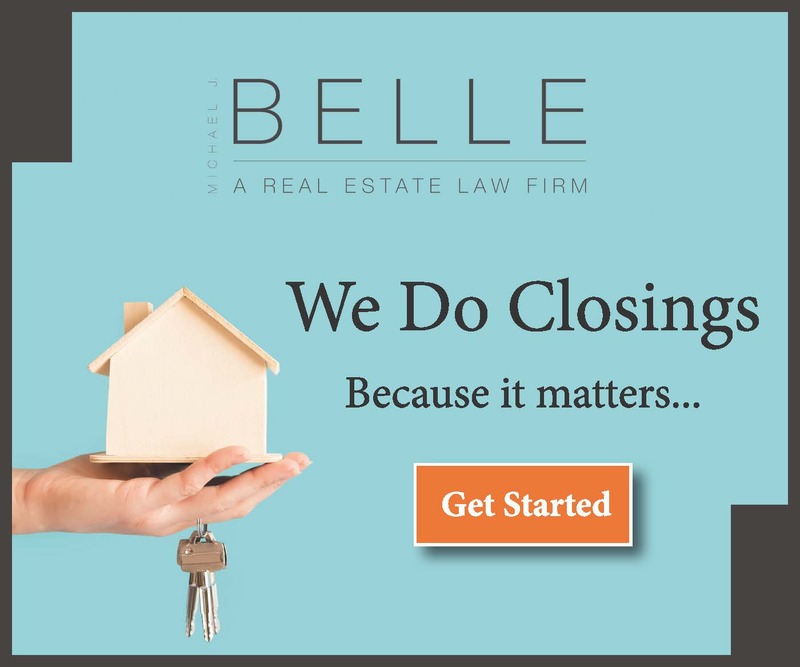 Year-over-year, combined closed sales in the two-county area increased by 8 percent. The condo market improved with a 27.3 percent increase in Manatee County and a 10.3 percent increase in Sarasota. 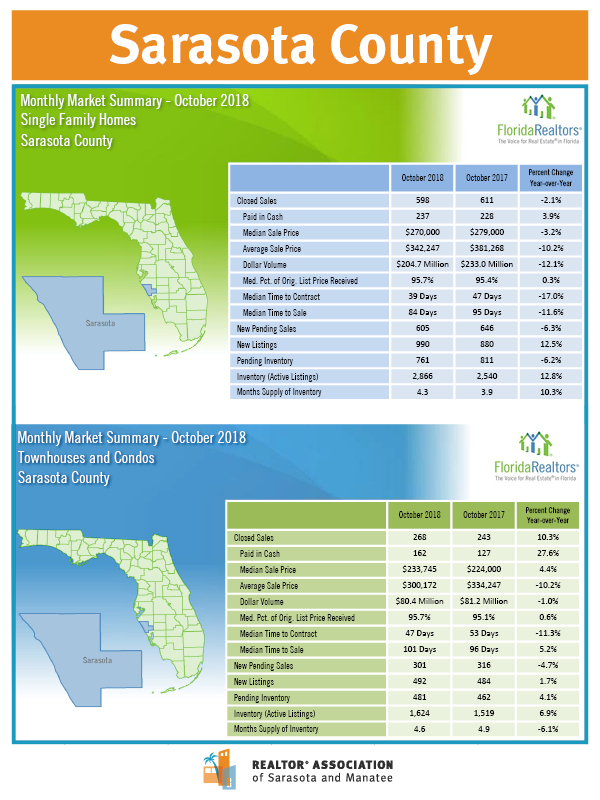 Manatee single-family home sales increased by 14 percent, while Sarasota single-family home sales decreased by 2.1 percent. In Manatee County, pending sales for single-family homes increased by 2.8 percent, while condos decreased by 3.6 percent. Pending sales in Sarasota County decreased by 4.7 percent for condos and by 6.3 percent for single-family homes. Median prices for Manatee single-family homes increased by 4.2 percent to $298,000, while Sarasota decreased by 3.2 percent to $270,000. Condo prices in Sarasota increased by 4.4 percent to $233,745 and Manatee decreased by 1.9 percent to $191,250. Aside from a decrease in the Manatee condo market, new listings increased year-over-year. For single-family homes, new listings increased by 12.5 percent in Sarasota and by 5.1 percent in Manatee. Condo new listings increased by 1.7 percent in Sarasota and decreased by 4.9 percent in Manatee. Inventory is up by 6.1 percent, compared to last year’s two-county area totals. Sarasota single-family home inventory increased by 12.8 percent to 2,866, while Manatee single-family homes increased by 0.5 percent to 2,092. Sarasota condo inventory increased by 6.9 percent to 1,624, while Manatee condo inventory is down by 2.4 percent to 810 available properties. With month’s supply of inventory falling under 5.5 months, a sellers’ market remains. Single-family homes in Sarasota increased by 10.3 percent from last year to a 4.3-month’s supply. Manatee single-family homes sit at a 3.9-month supply, a 7.1 percent decrease. As for condos, Manatee County decreased by 14.6 percent to a 3.5 month’s supply and Sarasota is at a 4.6 month’s supply, a 6.1 percent decrease from last year. 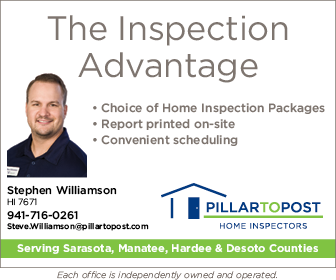 Monthly reports are provided by Florida REALTORS® with data compiled from My Florida Regional Multiple Listing Service. View comprehensive statistics dating back to 2005.